Rocky Hawkins was born in 1950 in Seattle Washington and grew up in small towns near the Cascades Mountains. His interest in the mystery and spiritual element of the Indian culture began with childhood. 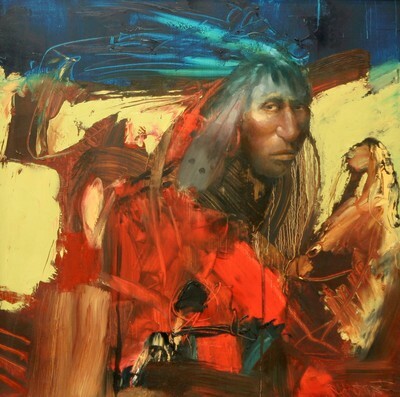 Traveling with his family to historic locations that conveyed Native American history, he was taken with the beauty and mysticism of the Indian´s individual expression. After finishing high school, he enrolled in college art classes then later attended the Burnley School of Art in Seattle WA. His art career began with illustration and commercial art but he found it didn´t fulfill his creative need and desire for self-expression. This realization led to his introduction into the world of fine art painting. His search to connect more closely with Native American inspiration has led him to reside in Montana. I paint with passion, risk and abbreviated images instead of capturing realism. Set against transit texture and vivid color, images and figures cannot be situated in reality. These painterly expressions challenge our emotions and communicate with our sense of mystery. Mystery is a part of life. Not everything is easily explainable. Many of the paintings seem to hold passageways detectable only at particular distances. Where you go, what you see, depends on who you are! Expect the unexpected. Enter into the world of the unknown.